One of the main reasons we created our festivals (here and in San Diego, and soon in other cities!) is to educate people on the importance and joy of homemade fermented foods. As such, we curate an all-star lineup of experts and personalities who share their passion and expertise. We’ve built an amazing lineup for this year’s Festival! Fermented foods are full of friendly bacteria that feed your gut and improve your health — or at least, that’s the story. How does the evidence really stack up? When scientists look at questions around fermented foods, what do they find? Lately some exciting scientific findings have emerged about the microbiome, diet, and health. But in the popular media and many diet books, facts are woven in with exaggerations in a tangled web of “microbiome hype” that’s hard to unravel. This talk will cover what scientists really know about fermented foods, gut microbiota, and health, and how to spot the exaggerated claims so you can act on reliable information for better health. Science writer Kristina Campbell (MSc) is the author of The Well-Fed Microbiome Cookbook (Rockridge Press, 2016) and an academic textbook on gut microbiota and nutrition (Elsevier, 2018). She writes and consults internationally on scientific topics related to gut microbiota, nutrition, probiotics, and the gut-brain axis, and has interviewed dozens of scientists around the world about nutrition and the microbiome. Did you quit cheese, or do you suspect you shouldn’t eat dairy because of a sensitivity? You don’t have to live without delicious cheese anymore. Though it has gotten easier to purchase dairy-free cheese especially in Portland, they don’t always taste like real food and they don’t work for all diets. Urban Cheesecraft makes it super easy and fun to make your custom flavor and ingredient dreams come true using real food. Use the seed or nut you prefer or even beans and veggies and then customize your cheese with delicious fermented foods like miso and sauerkraut for deep umami flavor. Come see how you can make custom, delicious dairy free cheese in under one hour! Claudia Lucero enjoys getting new cheesemakers started with Urban Cheesecraft and her DIY Cheese Kits- dairy and dairy free! She has partnered with Williams-Sonoma on custom cheesemaking kits and recently wrote the book One-Hour Cheese, which shows beginners how to make 16 fresh cheeses via step-by-step photos. The book is found where books are sold and the kits can be found on UrbanCheesecraft.com. A dairy-free cheesemaking book is scheduled to publish in fall of 2018. This talk will provide an overview of the American Gut Project and focus on specific sub-cohorts of interest (i.e., fermented foods cohorts) as well as our results on studying how the general public feels about contributing to the science. Dr. Embriette Hyde, a Forbes 30 Under 30 Scientist, is Project Manager of the American Gut Project, the largest crowd sourced citizen science project in existence. Prior to her work with American Gut, Embriette received her PhD on the human microbiome in health, disease, and death from Baylor College of Medicine (Houston, TX) in 2014. She then joined the laboratory of Dr. Rob Knight, where her research focused on environmental microbiomes and host-environment microbiome sharing. Embriette has spoken at dozens of conferences, festivals, and public events around the world, sharing the American Gut project with thousands, and has made several media appearances, including LiveWire (Portland, OR) and CNN’s Vital Signs with Dr. Sanjay Gupta. Join Claudia from Urban Cheesecraft for the easiest cheesemaking class you’ll ever take! Learn to make super easy but addictively delicious cultured cheeses from both yogurt and milk kefir. Beautiful cream cheese, herb covered logs, adorable wheels or bites preserved in olive oil are all possible for beginners. Join us for a demonstration and samples. The age old process of fermentation to preserve, alter and flavor foods is prevalent around the globe. About one third of all foods use a fermentative step during production, and the art of home fermentation has gained in popularity and media attention over the past decade. We are beginning to understand the molecular and microbial diversity of fermented foods using meta-omic analyses, and design studies to determine their potential health benefits. The Global FoodOmics project is pushing the boundaries of our knowledge and is building a publically available reference database for foods, including fermented dairy and vegetable products, beer, kombucha, etc. Come find out what it’s all about! Ever have a kimchi kraving, but then you realize all the ingredients and steps necessary to make it and you get psyched out? In this demo, Austin will show you how to make various styles of kimchi, a popular Korean fermented vegetable recipe, based on each season. He will also show you some tips to prep kimchi ahead of time, enabling you to make (nearly) instant kimchi! Of course, you’ll still have to wait for it to ferment. Austin Durant has been fermenting food for over seven years. 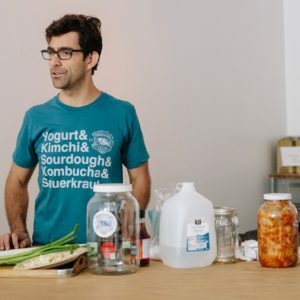 In 2011, he studied at Sandor Katz’ five-day Fermentation Residency Program in middle Tennessee, where he learned hands-on how to make over a dozen fermented foods. That same year, he founded Fermenters Club in his home town of San Diego to create a way for fermented food enthusiasts to make and share food. He began teaching fermented food workshops in San Diego, around southern California, and eventually across the United States. In 2015, he produced the first-ever day-long fermentation festivals in San Diego and Portland (Oregon). He then took a leap and left his day job at a software company in order to pursue fermentation education full-time. Mead is the world’s oldest fermented beverage and the original craft brew. But what is it? Where did it originate? How do you drink it and serve it? What foods complement mead for serving at home? This presentation will make you an expert and will have you excited to introduce mead to your friends! This discussion is for all food enthusiasts, whether you’re brand new to mead or if you produce your own honey at home!. Chrissie Manion Zaerpoor is the owner of Kookoolan World Meadery and Kookoolan Farms and author of the recently published The Art of Mead Tasting and Food Pairing. She’s been a mead enthusiast since about 1980; a home meadmaker since 1997; owner of a licensed commercial meadery since 2009; a founding director of the American Mead Makers’ Association (AMMA), its first Legislative Committee Chair, and Contributing Editor of its quarterly journal; owner / operator of one of the world’s first exclusively-mead bottle shops from 2012–2015; and a multi-time medal winner at Mazer Cup International Mead Competition, the world’s largest mead-only competition. She has written a regular mead and food pairing feature for the AMMA’s Journal since 2013. Natto, a type of fermented soybeans, is known for its health benefits, uniquely sticky viscosity and (some would say) funky aroma. In Japan, natto is typically eaten for breakfast, but how else can you incorporate this superfood into your diet? Learn how- along with some natto lore, its importland health benefits and how to DIY it. Heidi is the owner of Wanpaku Foods, which makes natto. She is also a personal chef and Community Nutrition Night Coordinator at the non-profit Quest Center for Integrative Health in Portland, OR where she gives presentations on cooking and nutrition, with an emphasis on fermentation. Did you know that the makeup of your microbiome (your gut and all its microbial inhabitants) influences the benefits you get from your diet, and that your diet in turn actively shapes the microbiome’s composition? It’s a two-way street. This panel discussion, featuring Dr. Embriette Hyde, Dr. Julia Gauglitz, and Kristina Campbell, MSc will address some basic questions about the human microbiome, how a healthy diet supports a healthy gut, and how fermented foods play a part in supporting health. This is your chance to ask questions to three of the thought leaders in microbiome science and research! Whether you’re perfectly healthy, or you suffer from a condition linked to gut dysbiosis, you’ll learn a lot from this discussion! Are you prepared for the most alluring aroma of all ferments? Many ferments stink. There is a delicious beauty in that fine line between fresh and rotten. The process of making koji doesn’t walk that line. Its 💩 really does smell like 🌹. But there is a catch; the only way you will ever smell this aroma is if you make your own koji at home. The koji sirens are calling you. Do you dare miss out? Learn simple techniques for incubating koji (and tempeh) at home with a large cooler, water, aquarium heater, and pump. It isn’t foolproof, but it isn’t hard. Even if you’ve never fermented before, you can start with koji. The act of seducing Aspergillus oryzae (or Rhizopus oligosporus for tempeh) is different than most ferments. Once you learn these techniques, you can use your new found love for koji to make miso, soy sauce, amazake, or roast your koji and use it as a flavoring ingredient with crunch. Author of the Everyday Fermentation Handbook and founder of FermUp.com. Branden lives near Seattle, Washington with his goats, ducks, dogs, wife, and son. Hear about the creation of SOMA Kombucha/Jun, Fire Brew Tonics, Rawkstar Creations and Rainbow Cloud Kombucha, and other local fermentation businesses. They’ll talk about the basic process, pitfalls and things to look out for so you can get your domestic kitchen-based business up and running! Listen in as they swap stories and advice, and answer your burning business questions. As a struggling writer in Los Angeles, Jean-Pierre Parent figured out how to both save money and get the healthiest he’d ever been by growing, sprouting, and fermenting almost all of his own food from his tiny one-room apartment. He’s studied food and nutrition for over 25 years both formally and experimentally, and is now a teacher, writer, and the owner of SOMA Kombucha Bars, with locations throughout Portland, Oregon. Emcee: Aaron Ross, Who’s The Ross? Aaron Ross is the host of PDX’s weekly late-night talk show “WHO’S the ROSS?” which has logged 700+ performances in the past 9 years. He is also the host of the rock & roll children’s show “YOU WHO? !” and has performed at the SXSW & Pickathon Music Festivals each of the past 5 years.